It’s a toss-up. I love spring when it comes. But I also love autumn when it arrives. Which do I like best? It’s hard to say. Both give me a sort of high, an adrenaline rush. Spring with its rebirth of nature, seeds emerging into living plants, flowers popping with magical color and morels scooting their little bodies up out of the earth. But autumn—there is something crunchy and fresh and exhilarating about autumn. There are also more edible mushrooms in autumn than any other season. Many people only think of morels when they think of edible Missouri mushrooms. But autumn brings so many other good and easy-to-find edibles. Did you ever hear of hen of the woods (Grifola frondosa), blewits (Lepista nuda) or lobsters (Hypomyces lactoflourum)? These are choice fall mushrooms. 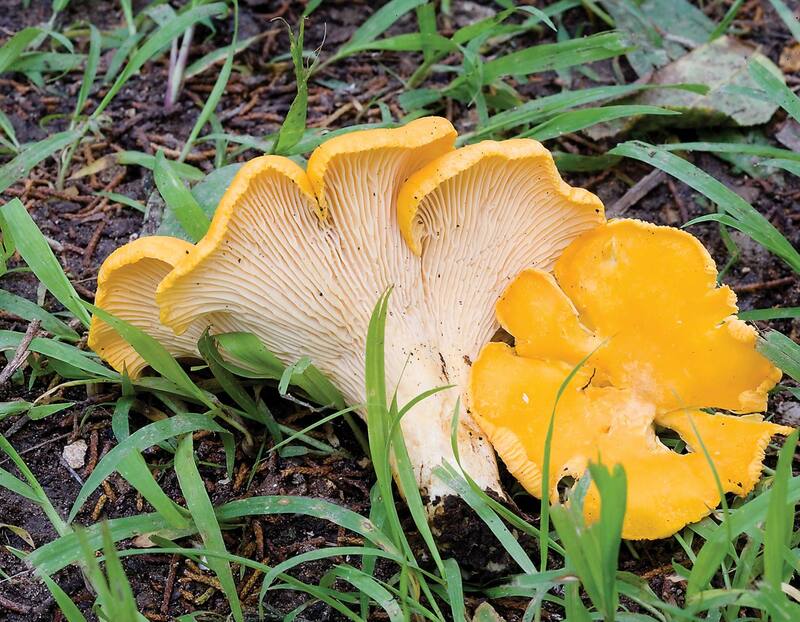 You might even find some lingering chanterelles (Cantharellus cibarius, C. lateritius), chicken of the woods (Laetiporus sulpheurus, L. cincinnatus), black trumpets (Craterellus cornucopioides) or oysters (Pleurotus ostreatus). These are wonderful mushrooms that fruit earlier in the season, but can also fruit in the fall. It’s so much fun to go looking for these prizes. But it’s very important to be 100 percent sure of what you have as there are a number of poisonous look-alikes. We are all so eager to find the good edibles that sometimes we overlook the perfect identification. Hen of the woods love oak trees. They grow at the bottom around the trunk. Often they are hard to see, because their color can blend in with fall leaves. But when you find one, it may be enough for a small army. Look for a large rosette with spoon or fan-shaped caps. Hens are hearty and meaty and make a wonderful mushroom soup. Sauté the onion in 1 tablespoon butter over medium heat. Add the mushrooms, dill, ½ cup stock or water, tamari and paprika. Cover and simmer for about 15 minutes. In a large pot, melt 2 tablespoons butter. Whisk in flour and cook a few minutes while continuing to whisk. Add milk. Cook over low heat until thick, stirring frequently, about 10 minutes. Stir in mushroom mixture and 1½ cups stock or water, lemon juice, salt and pepper. Cover and let simmer for about 10 more minutes. Garnish with chopped parsley and/or thick Greek yogurt. This has a deep, delicious flavor. Serve it with salad and a good bread. Mmmmm. Lobsters, oh lobsters! These may be my very favorite fall mushroom. They can be found in mixed woods, but seem to like pines best. After you find one, look for bumps in the ground, as they may be lurking just under the surface. Lobsters are interesting mushrooms. They are a bright orange-red color, but that color is actually a parasitic fungus growing on an ordinarily nonedible white mushroom. The parasite turns the nonedible into a choice edible. Lobsters are meaty and very flavorful and are a great addition to any dish that calls for mushrooms. Steam beans over water until crisptender, about 4 minutes. Drain. Transfer to bowl of ice water. Cool and drain well. Pat dry with paper towel. Set aside. Whisk 4 tablespoons olive oil, vinegar and thyme in small bowl. Add salt and pepper to taste. Set dressing aside. Heat remaining 3 tablespoons oil in large skillet over medium heat. Add mushrooms and shallot. Sauté until mushrooms are brown and tender, about 8 minutes. Remove from heat. Combine beans and mushrooms in a beautiful bowl. Pour dressing over all. Sprinkle with goat cheese and serve. When we’ve had a wet summer, there are so many other fall mushrooms to find. I am crazy about chanterelles. That’s partly because they are bright orange and easy to find. But they also have a delicate, almost sweet taste. Some people think they smell like apricots. Chanterelles like our Missouri oak/hickory forests and, on a good day, you’ll find lots of them in the woods near oaks. They go well with just about anything, but the simplest way to eat them is to just sauté them up and put in pasta or eggs, or just scoop them up with bread. Below is my granddaughter’s simple recipe. It’s fantastic. Melt butter with garlic and sauté until garlic is soft. Add chanterelles. Let them sauté for 4–5 minutes. Add a splash of balsamic vinegar, and salt and pepper. Continue to cook until done. Serve over rice (good), pasta (better), or bread (best). Enjoy. Oysters are another mushroom that you may find in autumn. You have probably seen them at the grocery store, but wild ones that you find are far superior to the store-bought variety. Look for them after a good rain on logs and trunks of trees. The recipe below has been perfected. It’s awesome. Put mushrooms in a large pot. Pour in beer and enough water to cover. Add garlic, salt and peppercorns. Bring to a boil and simmer for about 5 minutes. Remove from heat, drain, and cool. Arrange the oysters on a baking sheet. Melt butter in a pan over medium heat. Cook onion and garlic in butter until soft. Reduce heat to low, and stir in spinach, Monterey Jack, fontina, and mozzarella. Cook until cheese melts, stirring frequently. Stir in the milk, and season with salt and pepper. Spoon sauce over each oyster, as if you were filling a real oyster shell. Sprinkle with bread crumbs. Bake 8–10 minutes at 425°, until golden and bubbly. 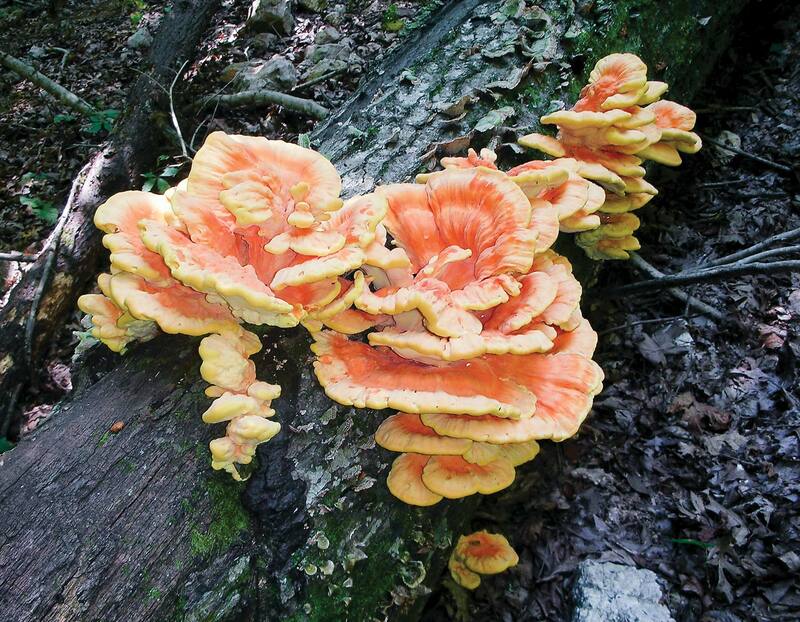 Then there are chicken of the woods. We grow two different choice species of “chix.” The sulphur shelf is bright orange on the top and bright yellow (like sulphur) on its underside. It grows on tree stumps and sometimes on the side of trees. As it ages it can get a bit woody, so just take the soft outer edges. The Cincinnatus is pale orange on the top and off-white to white on the underside. It is usually found on the ground clinging to roots. 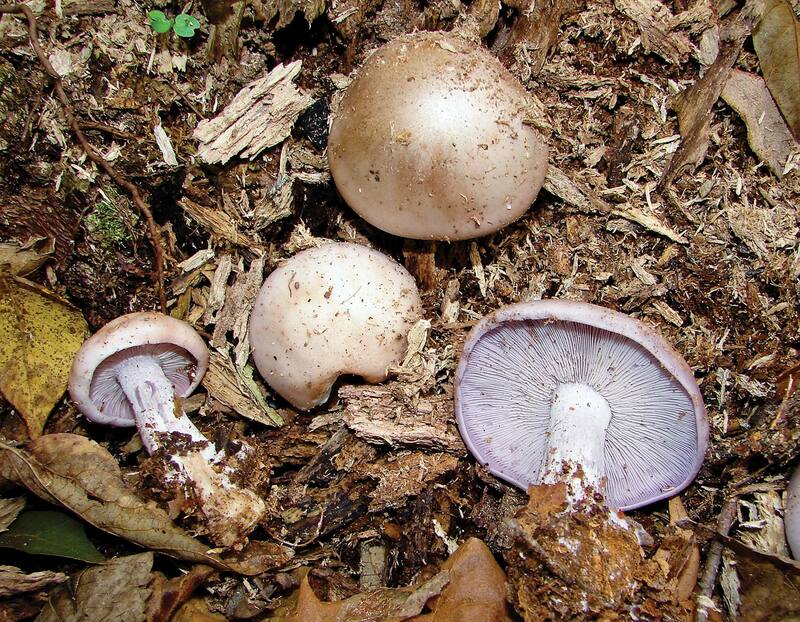 This species is tender all the way through to the center and the entire mushroom can be eaten. Both mushrooms are meaty and fabulous. They have the texture of chicken and can be used in any dish that calls for chicken. Boil the wild rice with 1 tablespoon butter and a pinch of salt, covered, on low heat for 55 minutes. Start preparing the remainder of the recipe about 15 minutes before the rice is done. Split the onion down the center from the top, so that it separates into strips instead of rings, and slice. Crush or chop the garlic. Sauté the mushrooms for 5–10 minutes, until almost tender. Add the onions and garlic, and sauté. Add the 2 tablespoons butter, sherry, rosemary, and salt and pepper to taste. Turn the heat down just a bit, and cook until the liquid has evaporated. Remove pan from the heat and toss in the capers. Pile the wild rice onto a serving platter, pile the sautéed mushroom mixture on top, and serve. Blewits are a bit less common. They are a violet-tan color. They like open areas, paths and mulch piles. I found my first in a mulch pile in my backyard. That was a happy day! They have a delicate flavor and can be used well with pasta or grains. If you find an edible mushroom but don’t have a recipe for it, I always suggest cooking it up in some onion and butter. Sauté until it gives off its liquid and this liquid evaporates. Black Trumpets are small, very dark and hard to see. But once you find one, you’ll probably find a lot more. You may see your first in rocky, mossy hillsides. These mushrooms look fragile, but they are not. The taste is a little chewy and yet delicate. Since their color is so dark, they look beautiful in foods with contrasting color, such as scrambled eggs or squash soup. 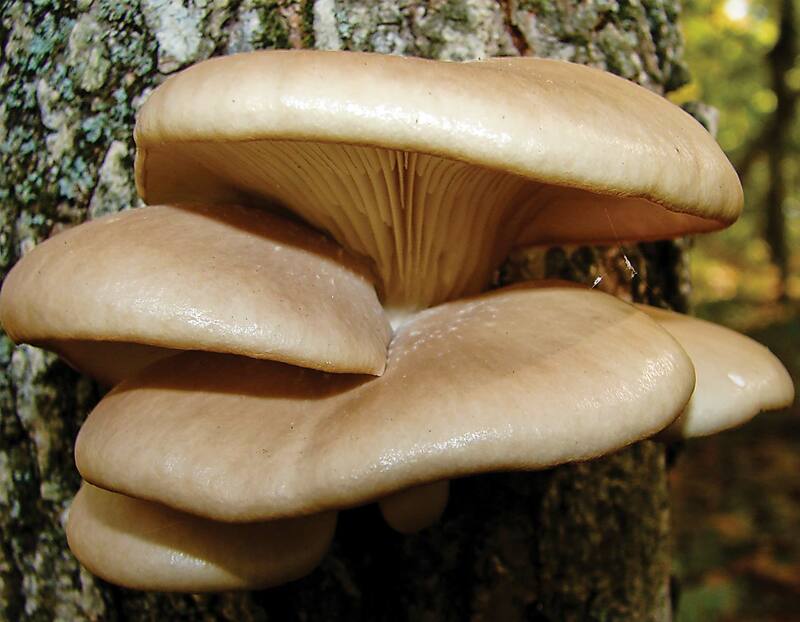 Oyster mushrooms grow in overlapping clusters on logs, stumps, and trees. The powerful air rifle adds a new dimension to deer hunting.